It is always useful to have a gun in your hand while gardening - only its the humble water spray-gun - nothing lethal about it. A hose of atleast 10 metres will be useful to ensure that you need not carry pails of water across the garden. Water your entire garden conveniently. It also doubles up to spray-clean your car and other vehicles. 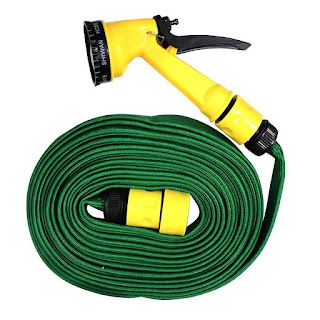 You can buy a multi-functional water spray gun here.